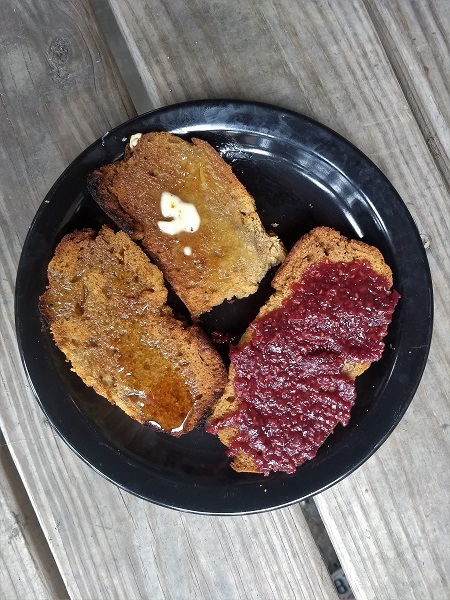 Hankering for a bite of Paleo bread but not so big on cooking it yourself from scratch? Take a peek at 5 brands of pre-made Paleo bread and bread mixes. Our taste-tester tried all five and wrote up some thoughts! This is not a sponsored post. None of these brands provided any food for free, paid anything for a good review, or influenced the reviews in any other way. All opinions are honest, uncensored responses to the food. These are pre-made muffins that you can buy in the freezer section of a grocery store. The same brand also makes a plain flavor and a toasted onion flavor. Here’s the thing about these muffins; they’re good, but they don’t have that traditional fluffy, just-a-bit-sourdough-y flavor of traditional English muffins. If you want a tasty breakfast food as a vehicle for honey or almond butter, these fit the bill. But if you’re specifically hankering for something that tastes just like Thomas’ English Muffins, you’ll be disappointed in these. 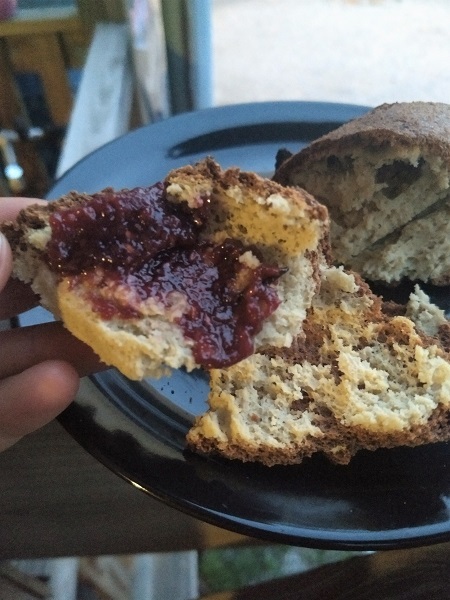 With that said, the cinnamon/raisin flavoring came through nicely and the texture reminded me a bit of whole-wheat bread. It was a very “unprocessed” type of texture; it tasted almost homemade. They were good with both butter and honey. Tasty with butter and jam; they’d probably also be good with honey or almond butter. This is a pre-made bread that you can buy frozen from a grocery store or online. The same brand also makes a bunch of different Paleo breads and wraps. I could not find a way to make this bread palatable. Just defrosted without any intervention, it was floppy and spongy. I tried one bite and realized I was going to have to gussy it up if I wanted to get it down the hatch. First I tried toasting it in a regular toaster. This yielded a product something like a warm sponge. I tried toasting it longer but got a weird burning smell so I stopped. 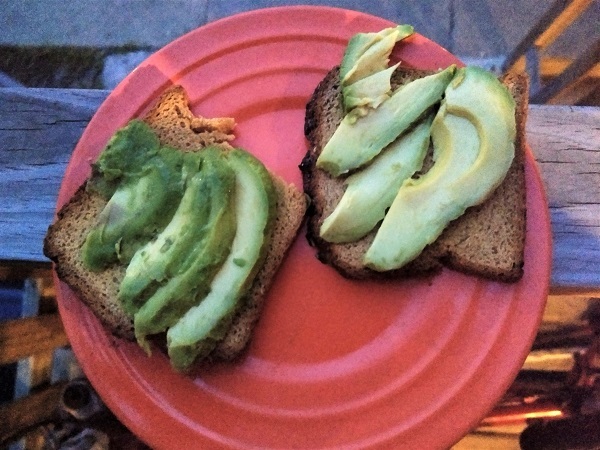 I tried putting avocado on it but quickly gave up on the bread and just ate all the avocado off the top. It was a tasty avocado. The bread went in the trash. One problem with toasting it was that the bread tended to fall apart in the toaster. So as an alternative method of toasting, I stuck it on a baking sheet under the broiler, thinking this would be a little bit gentler, but I STILL couldn’t get it toasty. 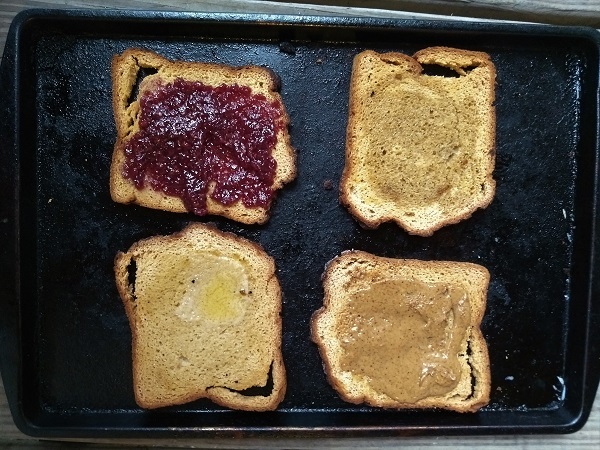 I left it there until the edges were literally burned black, which is objectively way over-toasted, but the middles were still soggy and floppy. All I really succeeded in doing with this was making toast that was simultaneously burned and soggy, not a pleasant eating experience. 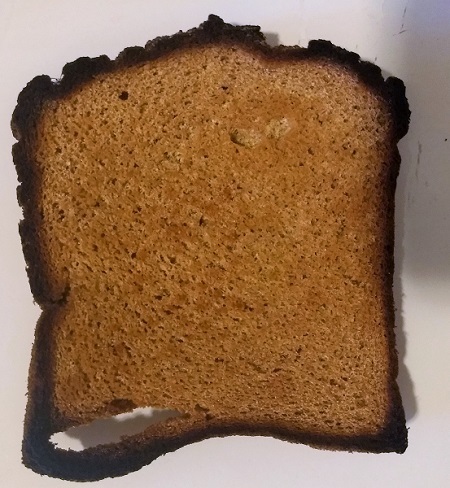 This toast is objectively burned on the outside but it was still floppy in the middle. 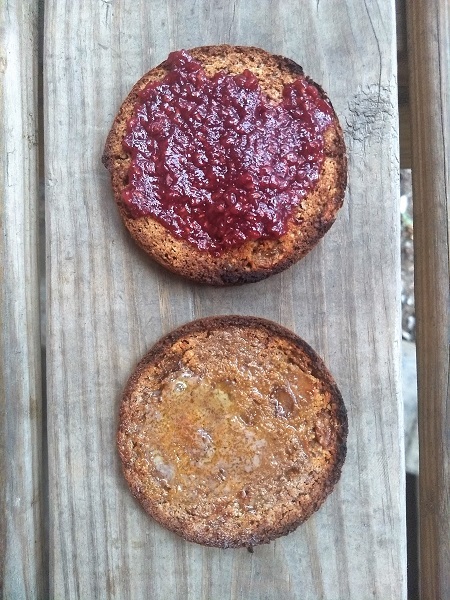 Clockwise, from top left: raspberry jam, honey, maple almond butter, regular butter. I took a first bite of each of these and didn’t want a second. I also tried making croutons with it to see if that would produce something I wanted to eat, but the croutons just weren’t great. I put them on a tasty salad (butter lettuce, red onion, mushrooms, salt and pepper vinaigrette, leftover rotisserie chicken) and ended up with a sad pile of unwanted croutons at the bottom of the salad bowl. Overall, I don’t recommend this bread. This is a mix that you can buy online. You’ll also need 6 eggs, 2/3 cup of coconut oil, 2/3 cup of honey, and about 2 bananas. 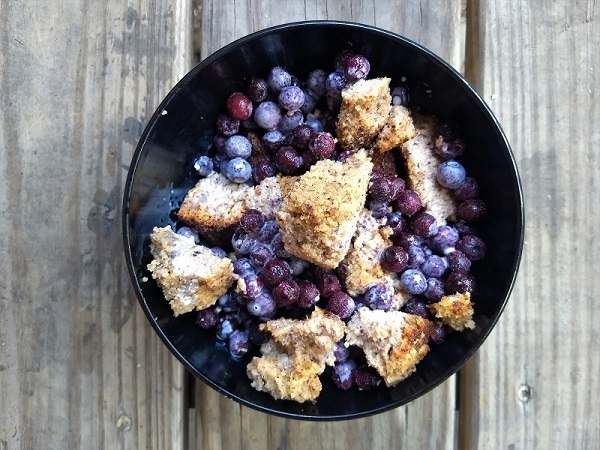 The same brand also makes a blueberry bread/muffin mix. This bread fell apart a bit while I was taking it out of the baking pan, but I very quickly forgot that because the bread itself was delicious. 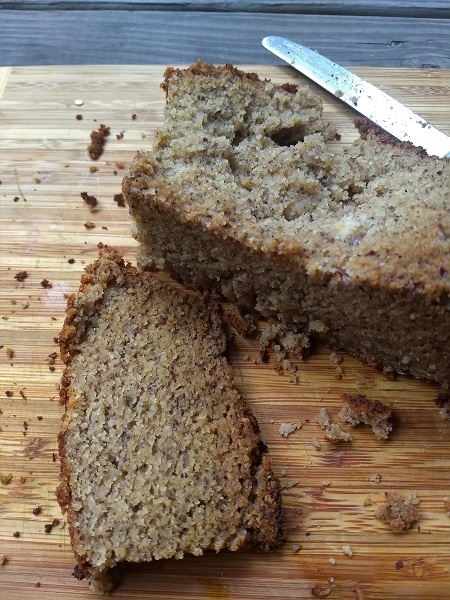 It was sweet but not too sweet, dense the way I would expect from banana bread, and with just the right amount of banana flavor. 10/10 on taste! This was extremely delicious but not a great solution if you want a piece of banana bread to hold and spread butter on. I followed the recipe exactly as written, but the package also suggested using the mix to make muffins instead of one large loaf. I feel like the muffins might hold together better (and in any case, they’d be in little paper cups for easier eating), so if I make this again, I’ll definitely go that route. This is a mix that you can buy online. The same brand also makes a regular sandwich bread mix. You’ll also need 1 cup of eggs or egg whites + 3 tbsp. apple cider vinegar. This bread had easily the best crust of all of them. It was perfectly brown and crispy and just begging to be bitten into. Very toothsome, to use a great old word that doesn’t get enough use. The recipe suggested adding herbs for variety, so I made two mini-loaves: one plain for reference and one with rosemary and olives. 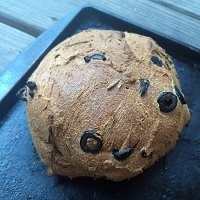 I used to love rosemary and olive bread before committing to Paleo but I hadn’t had it in years. The recipe called for 1 cup of either whole eggs or egg whites, with a warning that whole eggs would produce a denser bread. I used whole eggs to get all that wonderful nutrition in the yolk and also because philosophically I just don’t believe taking out healthy fat from whole foods. But as it turns out, I might have to rethink my position on egg whites in bread specifically, because this bread turned out a bit too dense in the middle with the whole eggs. Next time, I would get over myself a bit and just buy some whites to put in. So for everyone else cooking this, I strongly suggest you use only whites. Other than that, the recipe was great. 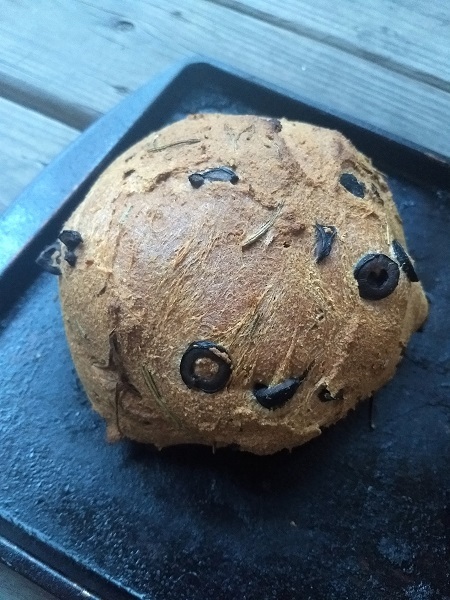 The plain and the rosemary-olive loaf both turned out very tasty. I didn’t use nearly enough rosemary (just 1 sprig) or enough olives (about ¼ cup chopped), but that’s on me. This is a dry mix that you can buy online. The same brand also makes a “blonde” mix. Of all the breads I tested, this is the one I would recommend if you want to make a sandwich, or even if you just want a nice toasted delivery vehicle for butter or jam. It didn’t taste exactly like the kind of sandwich bread you’d buy in a store, but it tasted really good and it held together well enough to toast in a normal toaster. 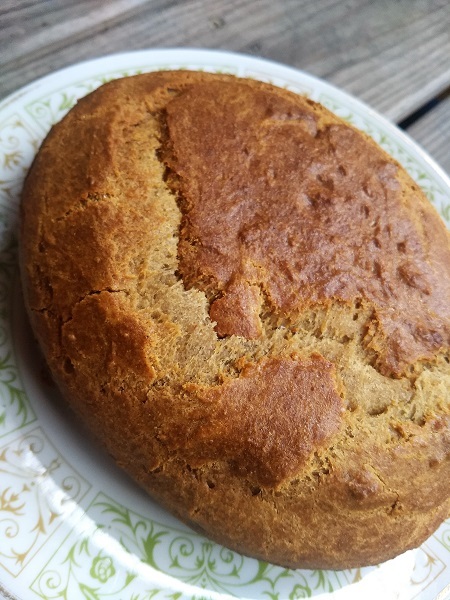 If you think of how whole wheat bread is a little more “rough” or “natural” than white bread, then this bread is a step up in texture from normal whole-wheat bread, with a similar taste. It was really good, if that’s what you want in bread! There’s not a huge amount to say about this – it’s a very no-fuss, easy recipe that gives you tasty bread. Taste-tester approved with butter, honey, and jam!